Skyline is dedicated to encouraging fitness and fun through the challenge of gymnastics. Our caring and experienced staff will teach your child using safe and proper technique. Skyline offers 4 different skill levels in our class program. To maximize learning, Skyline has 2 age groups within each level. Our A age group is for 5-7 year olds and the B age group is for 8 and up. Level 4 classes are all ages. In this level, girls will learn cartwheels and handstands, how to walk all different ways on the high beam, start building strength on bars and sky high jumping on vault! At this level, gymnasts will learn backbends and kickovers, start cartwheels on the low beam and hip pullovers on the bars. Vaulting is fun as your child learns to run, jump and roll onto our porta pit! 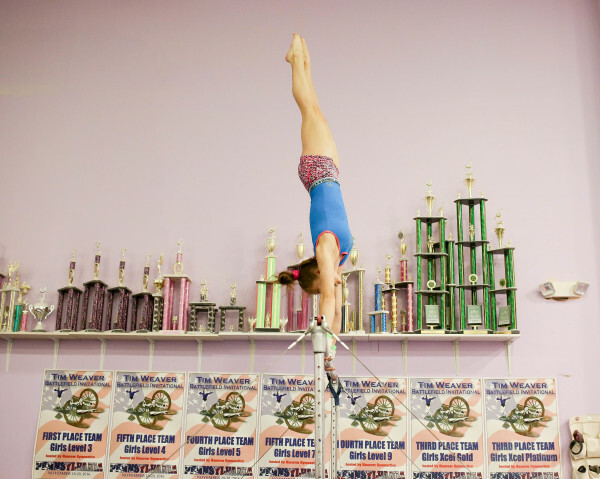 Your gymnast is ready to practice cartwheels and handstands on the high beam, walkovers and handsprings on the floor. Hip pullovers are a snap on bars and you will be doing back hip circles and going to the high bar with squat ons! Vaulting becomes a handstand flat back. where the sky is the limit! This class is 1 ½ hours long allowing more time for advanced skills and building strength and flexibility. Skyline will promote your child to the next level as soon as they are ready. It is so important for the confidence, self-esteem and safety of your child that they be placed in the appropriate skill level to start. If you have any questions concerning placement, please call Skyline and we will help you place your child for success!